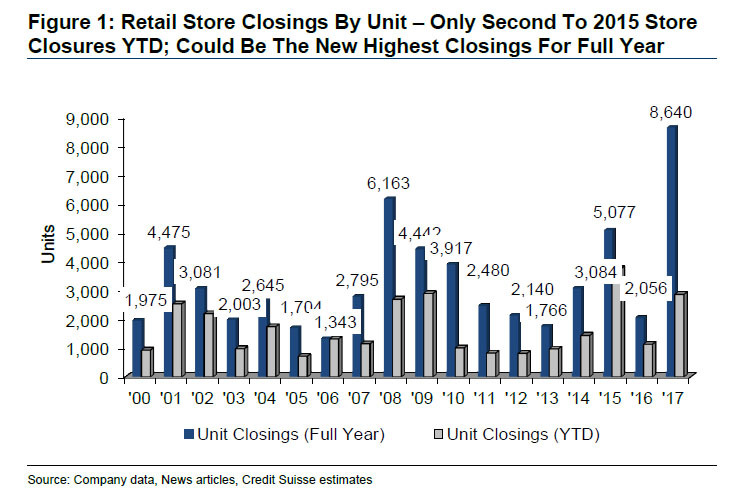 At 6,163 store closures and counting, 2017 is already one of the worst years on record for closures at the six-month mark, second only to 2008 during the start of the Great Recession. However, 2017 is expected to breeze past that record and hit a new low for retail shops and the many retail workers who have already begun to bear the brunt of the fallout. 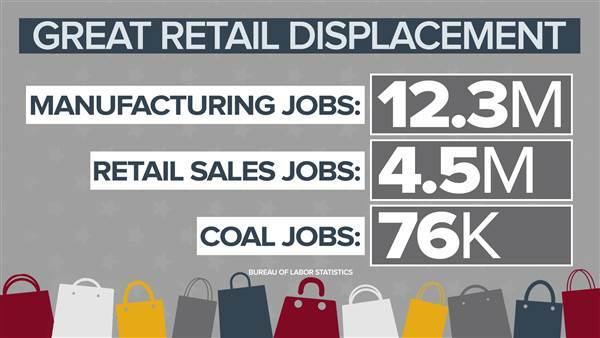 MarketWatch found that over the last year, the department store space bled 29,900 jobs, while general merchandising stores cut 15,700 positions. In May 2017, The Bureau of Labor Statistics reported that there were about 19,000 fewer people working in department stores compared to January 2017. In May 2017, the US Bureau of Labor Statistics released data suggesting about 7.5 million retail jobs may be replaced by technology. 37.7 years old is the average age for a retail sales worker. The retail sales worker earns a median annual wage of $22,900. BLS numbers reveal that nearly half of all retail workers are female. In clothing stores, the percentage of female works is nearly 75%. The demographic of retail salespeople is similar to that of the entire country, with 66% of workers identifying as White, 16% Hispanic, 11% Black, and 5% Asian. The Retail Bubble, Amazon, & a Silver Lining? The majority of industry experts agree that the retail bubble is real, currently bursting, and largely due to the overproduction of retail spaces, the rise of e-commerce (championed by Amazon), and the shifts in American consumer behavior. Between 1970 and 2015, the number of malls grew more than twice as fast as the number of people in the U.S. Mall visits fell 50% between 2010 and 2013 and have fallen every year since. Today, there are 1,200 malls in the U.S. In a decade, that number is expected to shrink by 25%. As mentioned earlier, apparel sales are actually expected to rise. By 2030, it is predicted to double to 35% of all e-commerce from 17% today. According to Beacon Economics founding partner Christopher Thornberg, Amazon is simply taking a larger share of of the brick-and-mortar sector than ever before. Since the start of the Great Recession, the e-commerce sector has created 355,000 new jobs, compared to about 50,000 total jobs lost in physical retail stores. Much of that growth has come from large fulfillment centers in warehouses. Warehousing is not used exclusively for e-commerce, but the change in warehousing jobs is highly correlated with Amazon’s job growth in the state; since 2009, warehousing employment has soared by almost 50%. Fulfillment centers pay 26% better than general retail jobs, and warehouse wages are currently growing twice as fast as the national average. Retail brands have more to lose than stores and sales associates. The retail brands that survive this market correction will have to think in the long term. Aside from continuing to shift business operations to facilitate more competitive online sales growth, and job growth, retail brands must also keep an eye on the strengthening link between employer brand and consumer behavior. 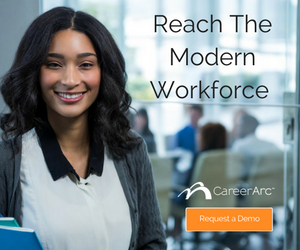 64% of applicants who had a poor candidate experience were less likely to purchase goods and services from that same company. Most overlooked brand risk: The long-term unemployed (jobless for 27 weeks or more) are 2.5x more likely to share negative reviews about an employer on social media than the short-termed unemployed. Biggest Opportunity? Outplacement: Nearly 70% of unemployed job seekers who were offered outplacement services say it improved their relationship and/or perception of their previous employer. There is a growing body of statistics that aim to unearth the true cost of a bad employer brand. Retail brands that have had to, or are about to, undergo the difficulty of layoffs during this transition, must now more than ever reflect on how they treat their employees as they exit the organization. Providing adequate severance and career assistance like outplacement could very well determine if the employees who leave the organization later return as loyal customers. At 6,163 store closures and counting, 2017 is already one of the worst years on record for the retail industry. 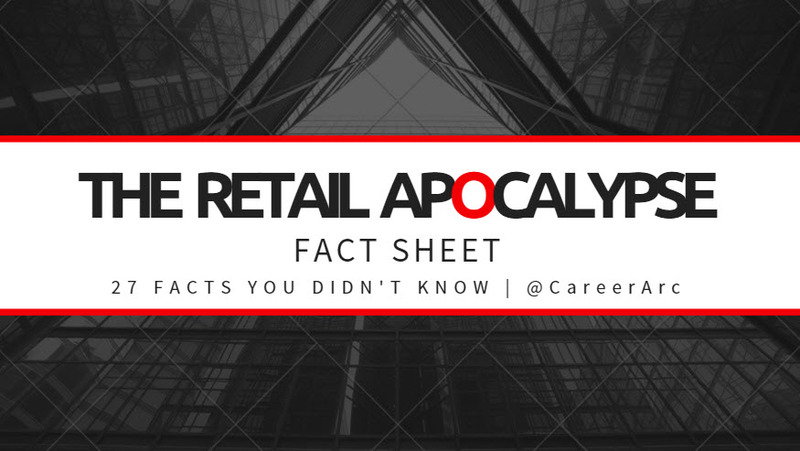 Read the Retail Apocalypse 2017 fact sheet.